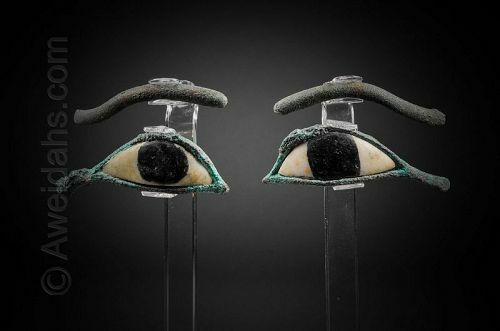 A fine pair of ancient Egyptian bronze & alabaster almond-shaped eye inlays and eyebrows, the well-formed lid and cosmetic line crafted of bronze and inlaid with irises of alabaster; the pupils in black pigment. Perhaps from an anthropoid sarcophagus mummy mask or a monumental statue. With remains of azurite and encrustations. Professionally mounted on a Lucite “Plexi-glass” display stand.